Ever wondered how the world would be if a color goes missing? In the interactive children's storybook app Red in Bed, find out what happens when Red falls ill and cannot join the other colors in painting the things around them. Red in Bed is a musical storybook app that introduces juniors to colors. Red in Bed begins with seven colors who wake up one morning to find that Red is sick. The other colors band together to tint the world while Red stays in bed, but things just don’t look the same. 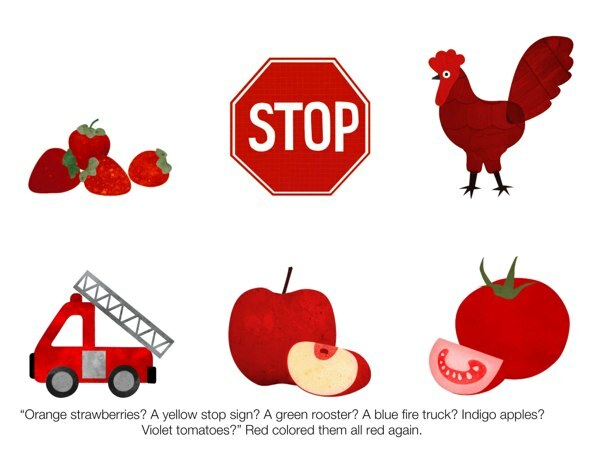 The strawberries are orange, the stop sign is yellow, and the rooster is green! Fortunately, Red starts to feel better and soon, goes off to put things back in order. The world is a happy place once more, and the colors go home for a good night sleep. When Red falls ill, the other colors work together to paint the things around them. Created by a dad for his two-year-old daughter, Red in Bed is an amusing and interactive tale that explores the colors around us. In the app, kids can learn the names of seven different colors and the objects that they associate with. For example, yellow is the color of bananas and green is the color of leaves. As you move through the pages, you can tap on the grayscale illustrations to see them magically turn color. You can also tap on each color to hear it play a note of the major musical scale. It is also interesting to note that the row of colors on the front page doubles as a xylophone. The app can detect multiple touches at the same time, so you can play some interesting tunes. There is even an option to lock the front page so that you won’t accidentally move to another page while playing the xylophone. This is a fun feature that significantly increases the app’s value and lifespan. Red in Bed is available in several languages: US English, British English, French, Spanish, and Hungarian. One thing that I have to mention is as of the current version (1.0), the app has no narration. However, I believe that it is an excellent story to read together with your junior. Red in Bed is a delightful app. Having read it several times already, I think it may be one of my top five storybook apps for toddlers. First of all, the story is just adorable. It is simple, short, and suitable for the app’s targeted age range. I also think that it's a classic that you can read over and over again without feeling outdated. The illustrations are colorful, as expected from a story about colors. They are beautiful in their simplicity, and I applaud the developer for his choice of colors and great use of white space. Finally, I have to say that the best part of the app is its simple yet entertaining musical interactions on each page. There is enough going on to keep young readers engaged, but not too much to distract from the story. The xylophone on the first page is a nice touch as well, and it is an incredibly fun way to stimulate creativity. Red in Bed is an engaging storybook app that introduces juniors to colors and music. It has a great story, lovely illustrations, and fun musical interactions that will keep young learners entertained. I would highly recommend it to parents with juniors ages four or below. When I Grow Up.... Colorful app teachers juniors about different professions. The Going to Bed Book. Whimsical, sleepy story of animals preparing for bed aboard a ship.